Hey guess what, we just got married! 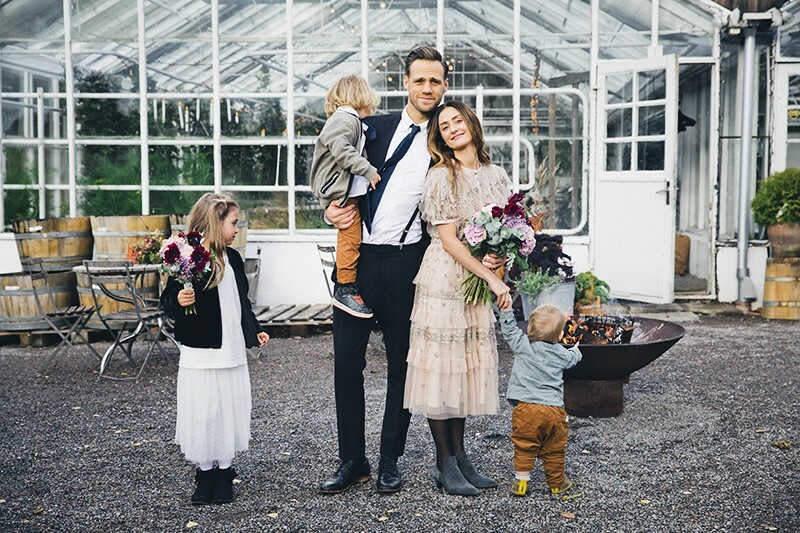 In a beautiful greenhouse in Rosendal’s Garden in Stockholm, surrounded by our closest family and friends (+ ALL their kids) and accompanied by live jazz music and gorgeous food. Even though I proposed to Luise in the back of a campervan on New Zealand almost three years ago, we pulled this wedding together – from idea to ”I do” – in less than five weeks. With three young kids, constantly overflowing mailboxes and an unhealthy always-need-to-be-in-control tendency, we realized that if we don’t do a quick and spontaneous wedding we probably won’t get hitched until we are retired. 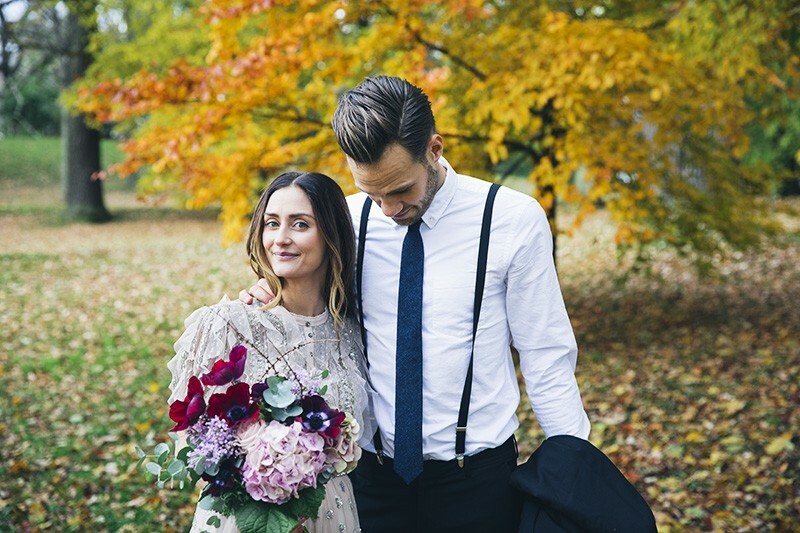 So instead of our dream wedding going on for three days and nights in the Italian country side, we aimed for an informal and cosy autumn gathering in one of our favorite Stockholm locations. 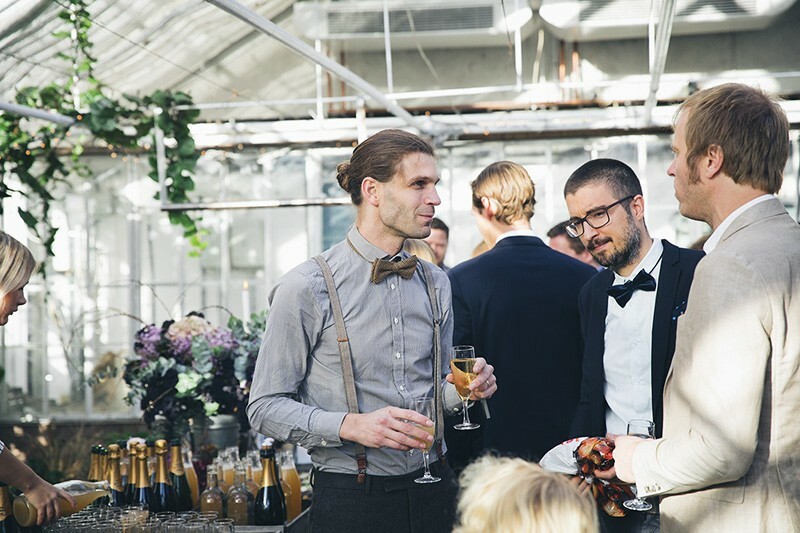 It turned out so much better than we could ever have hoped for and we are now officially mr and mrs.
We let the chefs at Rosendal take care of all the food (which was a huge relief). Our only instructions for the lunch buffet (lunch is much easier if you want friends with kids to attend) was that we wanted hearty salads and food roughly in line with our own philosophy. 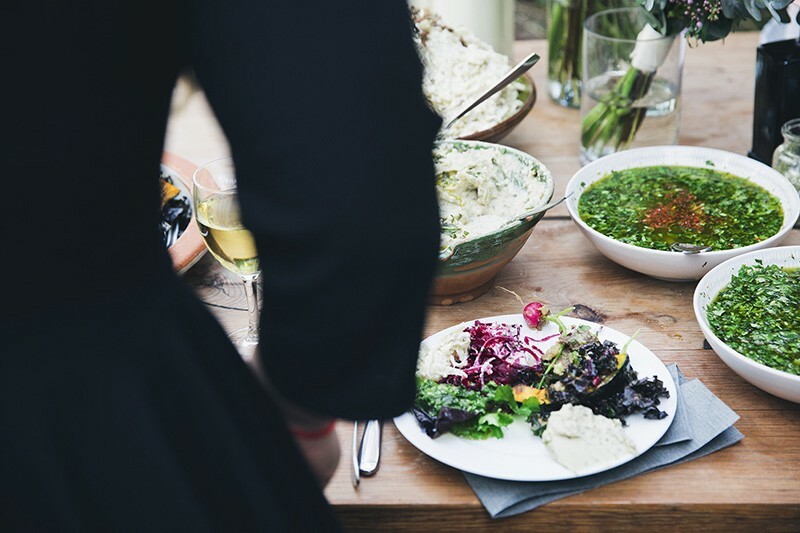 Typically, we didn’t get any photos of the whole buffet table, but there were roasted vegetables, butter tossed potato and chanterelles, slaw with pickled mustard seeds, hummus, sourdough bread, sauerkraut, a goat’s cheese salad with shredded beets, herb sauces and lots and lots of cake. All seasonal and local, pretty decorated with fruit and flowers. And so good! 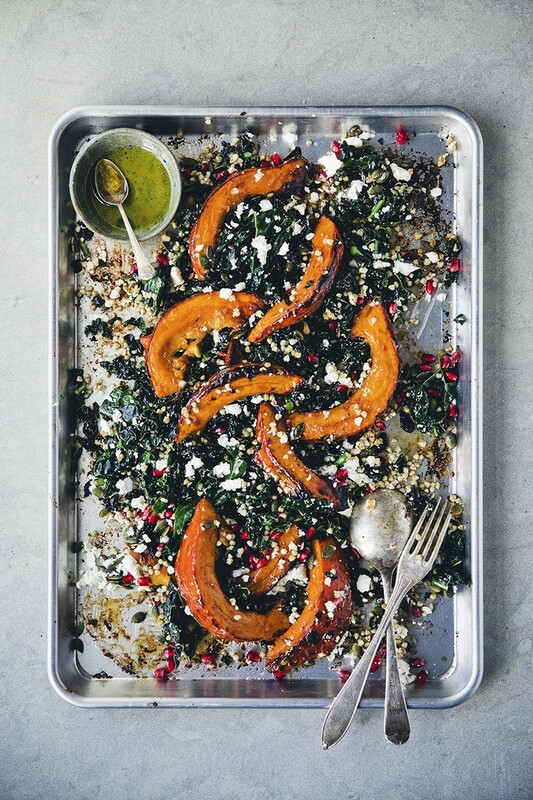 Another salad that they prepared was made with roasted pumpkin, cavolo nero and buckwheat and we have recreated our own version of it here below. We never got the exact recipe from the chef so this is a pretty loose interpretation of how we remembered it (after a couple of glasses of champagne). We are sharing that today along with a few snaps that David’s sister took at the wedding. Forget everything I’ve previously stated about marriage. This was fun! And I feel damn fortunate to marry the most beautiful woman I know. These two guys were so good! 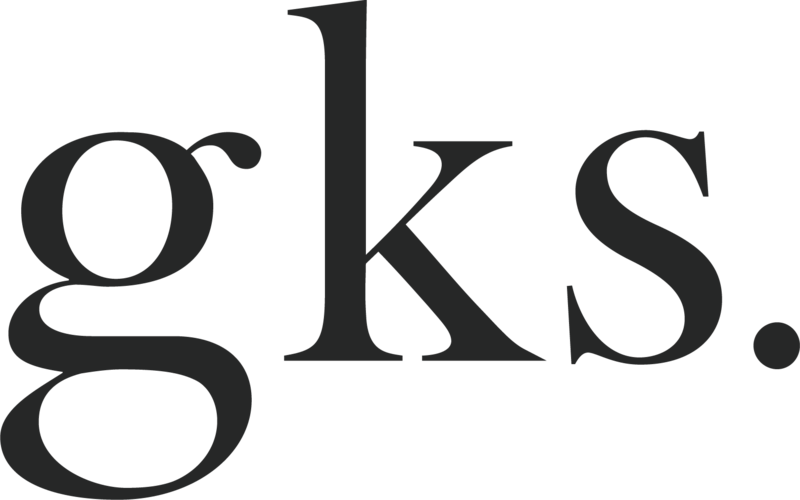 Send me an email if you need Chet Baker-style jazz musicians in Stockholm and I’ll forward their contact info. This is a gorgeous and rustic recipe perfect for this season. It would also be ideal for Christmas, maybe with some cinnamon added to the dressing. One of the things we really love about this is that you don’t need to peel the pumpkin (which always is a hassle), just cut into wedges and you can even keep the seeds on. Some of the seeds might get a little burnt but the one hanging on to the slices add a nice crunch. We cover the pumpkin wedges in dressing both before and after roasting to give them a delicious coating. Set the oven to 200°C / 400°F fan mode. Divide the pumpkin in half and then cut it into wedges. Leave any seeds that are hanging on to the wedges and discard the rest. 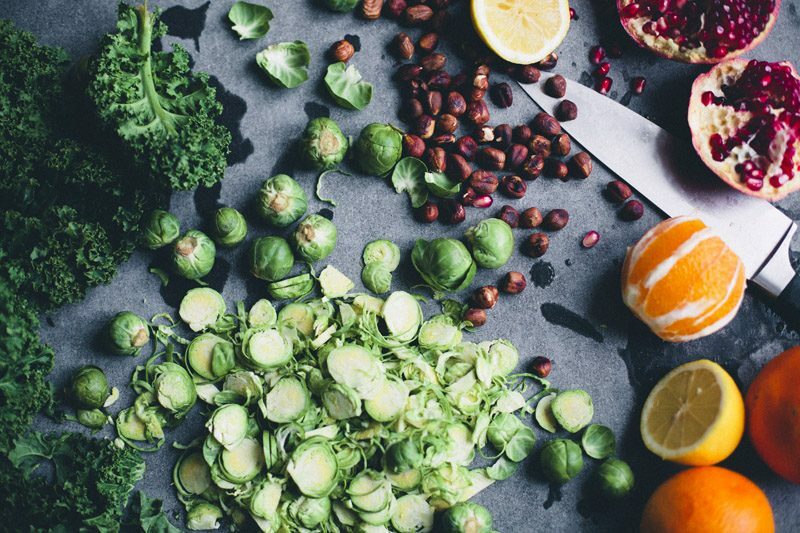 Stir together the dressing, taste and adjust the flavors. Pour about half of it in a bowl and toss the pumpkin slices in it (keep the remaining dressing in the bowl). Place on a baking tray and roast for about 25-30 minutes. We like it a little burnt towards the edges. When roasted, carefully loosen the wedges from the tray and brush them with the remaining dressing in the bowl. While the pumpkin is roasting, cook the buckwheat groats in 2 cups water for 7-8 minutes until soft but not mushy. Drain any remaining water and leave to cool off a bit. 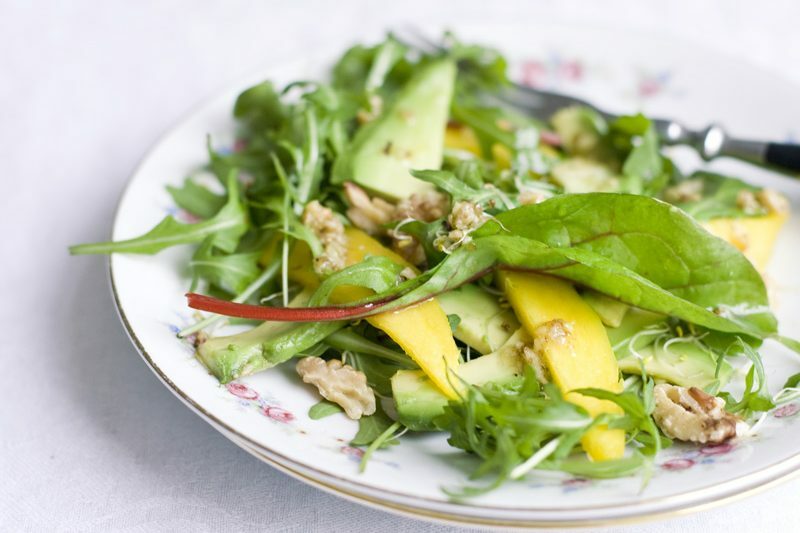 Add the remaining half of the dressing to a large bowl. 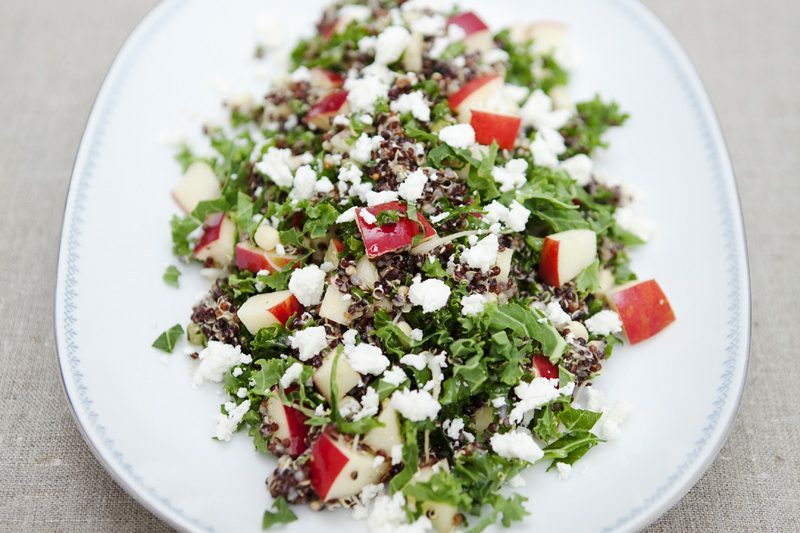 Tear the kale leaves into smaller pieces, place in the bowl and use your hands to massage them until they soften up. Add the buckwheat to the bowl and toss so it’s all mixed. 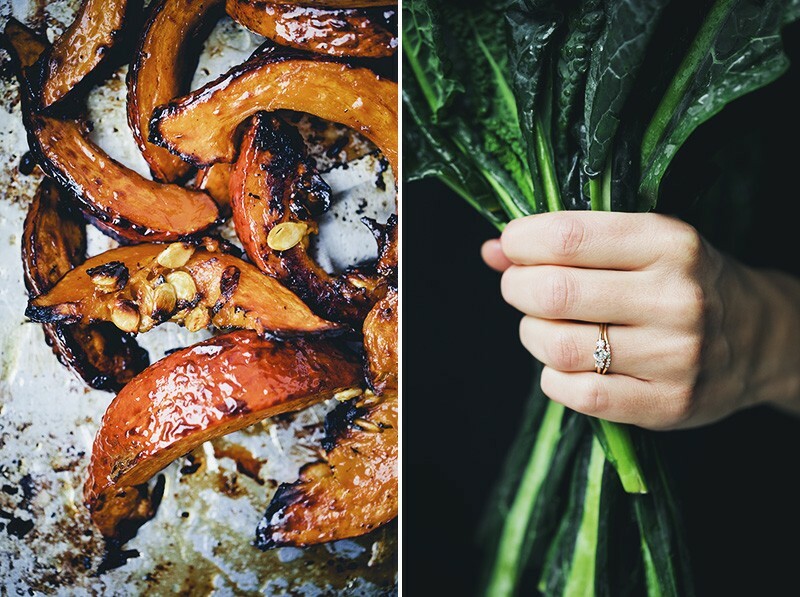 Arrange the kale and buckwheat on the tray (or a serving plate) together with the pumpkin wedges. 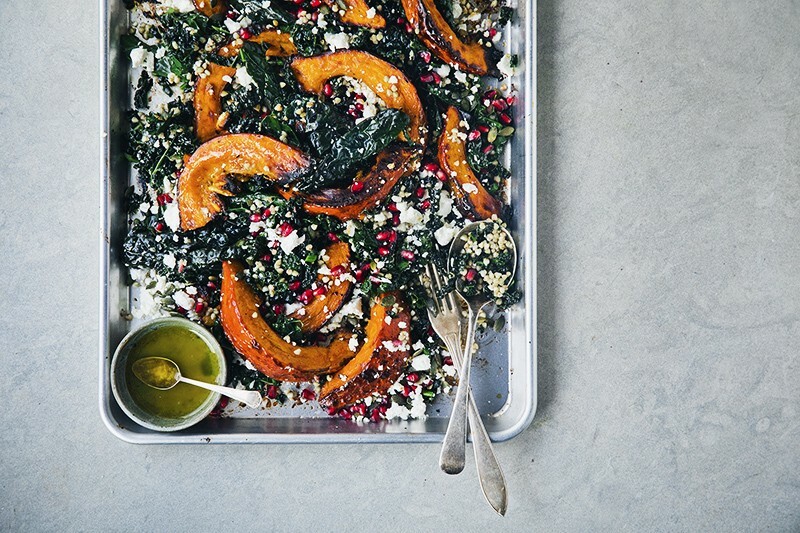 Scatter with pomegranate seeds, pumpkin seeds and crumbled feta cheese. Enjoy! 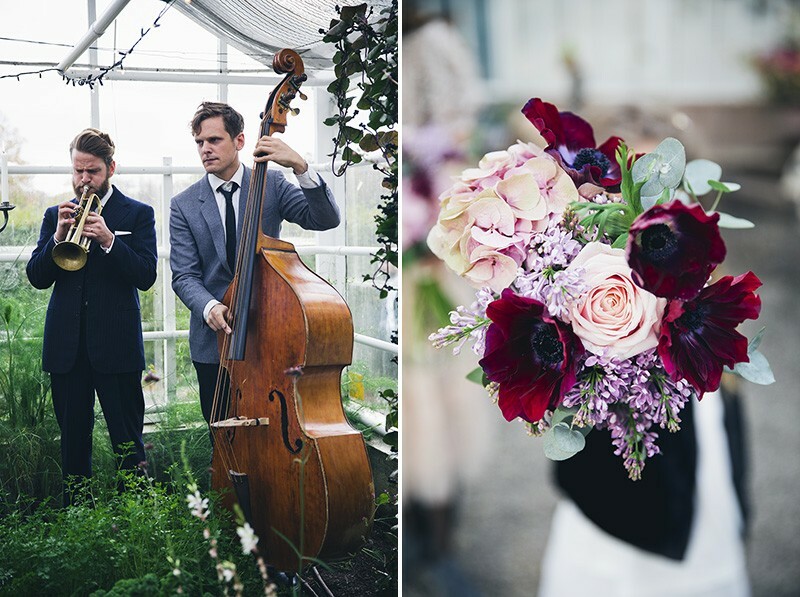 Wedding photos by Johanna Frenkel. Congratulations on your wonderful wedding!! We had a similar idea to want a Colombian-Italian 3 day wedding celebration but ended doing something like you and it was great!! Thanks for sharing!! love your recipes, pictures and all. Wishing you lots of happiness. Congratulations! 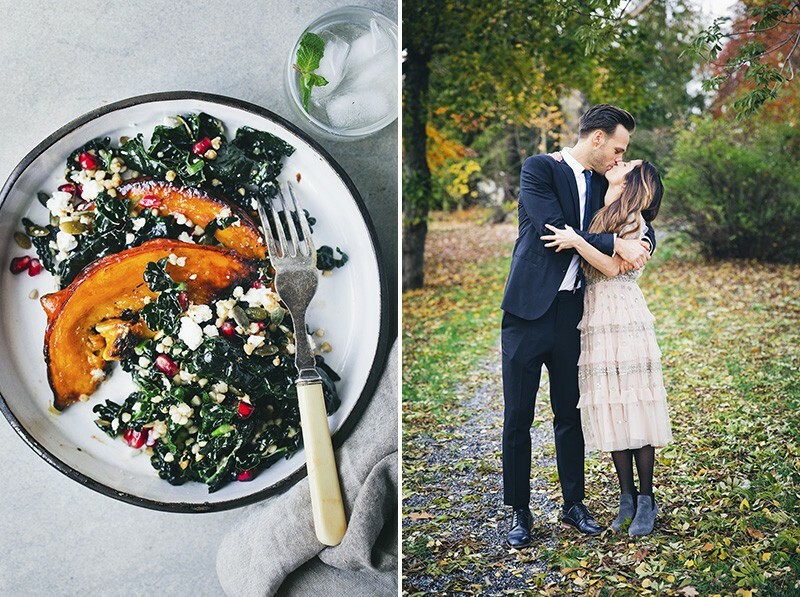 What a beautiful venue and the food sounds wonderful-love the pumpkin and kale recipe. Wow, what an amazing venue! 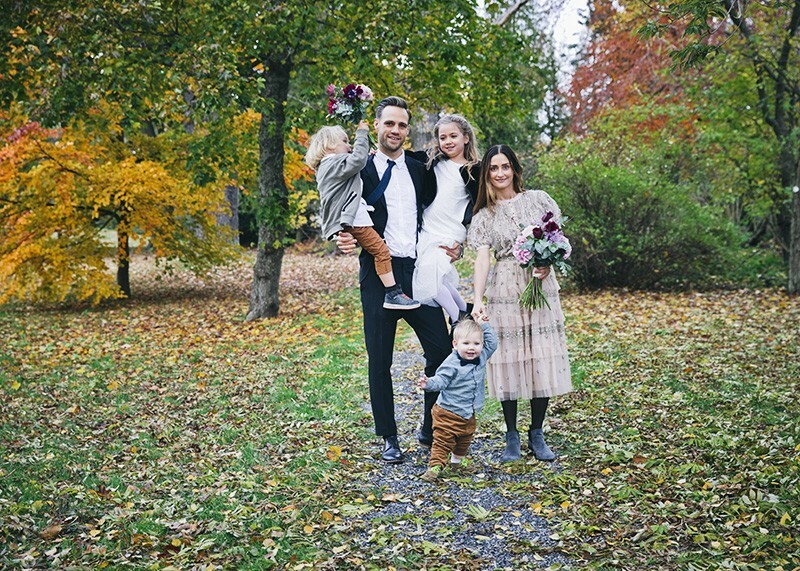 What a gorgeous family. Gorgeous pumpkin salad. All of it is just... gorgeous. Congratulations! I just love your pictures and stories. And of course your recipes. This post put tears into my eyes, that usually doesn't happen easily. I am so happy for all of you and I wish you all the best in the world. How wonderful congratulations! 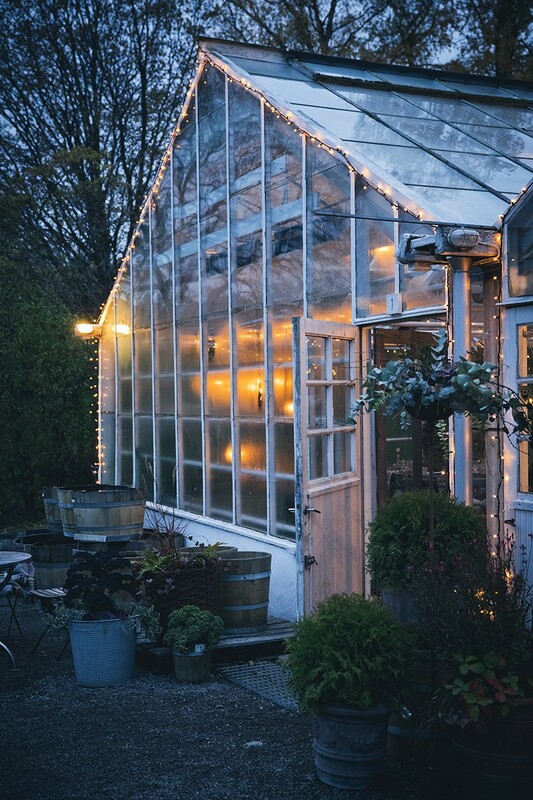 I had afternoon tea in that greenhouse last winter and there was a Wedding Party in the same room, I think it's just magical! Congratulations! you are such a beautifull family. CONGRATS GUYS! 🍾🎊 All of our very best wishes. You’re the best couple ever. Lovely! vad härligt! Gratulationer till hela familjen! Och tack än en gang för era underbara recept som inspirerar till bade vardag och fest! Congratulations! <3 You two both look gorgeous & happy, and the wedding looks so classy and beautiful. I have to ask: where is the beautiful bride's dress from? It is beyond lovely. T.
And now I have to ask, where did you get your suit?! (Asking for my fiancée.) You both look beautiful and immensely happy. Congrats! Congratulation for your mariage and loving your receipt. All the best from Switzerland. Congratulations, looks like you had an amazing wedding! 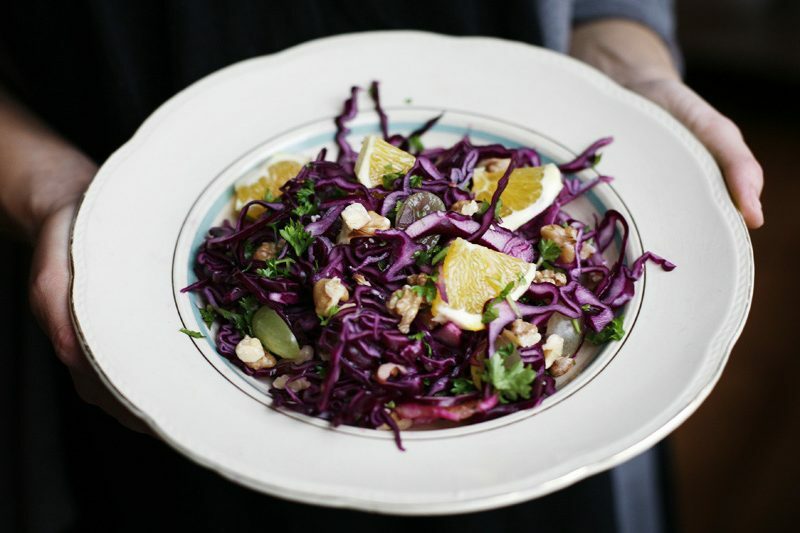 The salad looks great, I love pomegranate in winter salads. Congratulations on your marriage, it looks like you had a really lovely wedding! The last picture of you two reminds me of my partner and I, there's a solid foot of height difference between us too, hah. Knocking it out of the park as usual with this recipe.